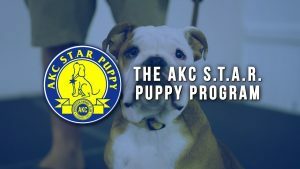 Socialization, Training, Activity, and Responsible Ownership are needed to earn the AKC S.T.A.R. Puppy recognition with us. Any dog under the age of 1 year is eligible to earn this prestigious recognition. Puppies must participate in a 6 week course and pass the evaluation. Puppies can participate in our Doggie Manners class, Agility for Fun class, or our Fun With Tricks Class to fulfill the 6 week class criteria. This program is a great first step to earning your Canine Good Citizen or if you plan to test for Therapy Work with your dog. Learn more about the S.T.A.R. Puppy program here. This is offered as an add on to our group classes and trainer must be notified on week one that you would like to test for the S.T.A.R. Puppy. Testing for the S.T.A.R. Puppy is $15 due to trainer on the day of test (last day of class).